I try by command set-buffe-file-coding-system but it not help. As you can see this command not help. To fix this I need to encoding content to UTF-8. Here test case when I apply function "find-file-with-coding-system" with KOI8-R of @Tobias, but it not help. Also I try by emacs-Q, but result same. 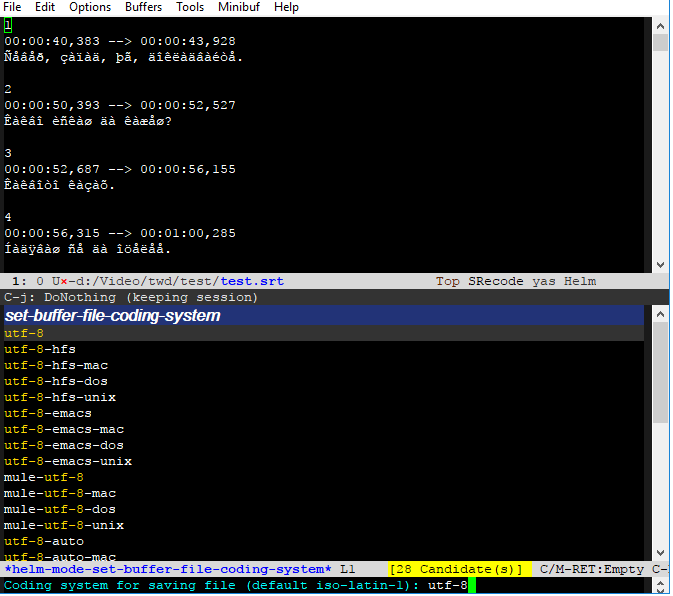 Emacs decodes a text file with an appropriate coding system when you open it with find-file. If you have to tell emacs for some reason what coding system it should use for decoding the file you should do so before you open the file. You can set the coding system for the next command with Options -> Multilingual Environment -> Set Coding Systems -> For Next Command. 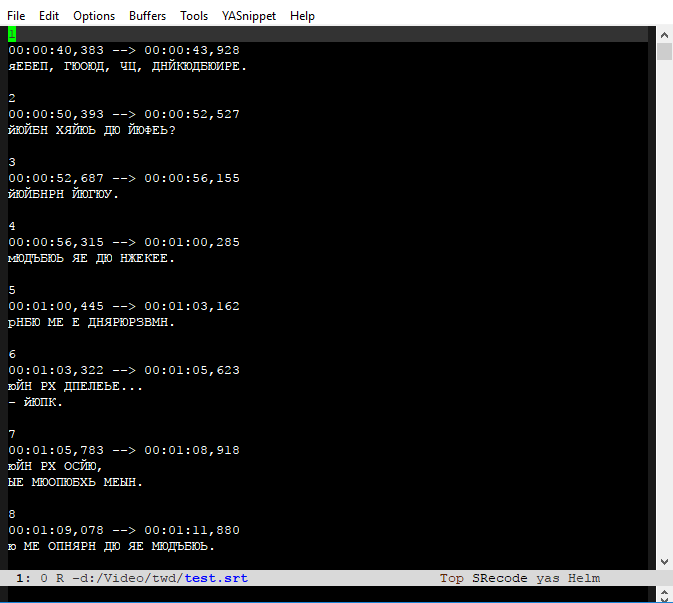 That next command can be find-file for your file subtitle.srt. The file is then read with the coding system of your choice. If you often need to open files with specified coding system you can also use the following command. Paste the code into your init file and restart emacs. Afterwards you can use the new menu item Find File With Coding System in the File menu. Note that normally the coding system of the file is automatically detected. For newly created buffers and for buffers where the coding system cannot be uniquely identified the option default-buffer-file-coding-system determines which coding system is preferred. As far as I know there is no predefined function changing the buffer file coding-system for decoding without re-reading the file. And the last question: Is it possible to correct decode file AFTER open? Maybe, that function is not provided since the decoding is not necessarily injective and the translation of the coding system can fail. Nevertheless, the next lisp function tries to change the coding system for decoding without re-reading the file. "Translate buffer encoding from SOURCE-ENCODING to TARGET-ENCODING." Your problem has nothing to do with utf-8. Your screenshot of Notepad++ indicates Windows-1251 encoding for that file as you can see at the right end of the status line of Notepad++. Therefore you have to select windows-1251 and not utf-8 as coding system. You can use my other answer for a first try with windows-1251 encoding. 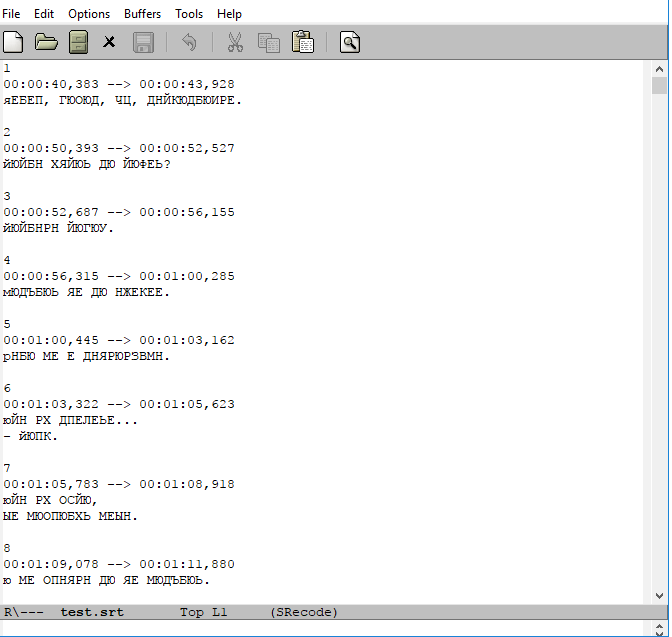 It seems that Notepad++ is setup for a Russian language environment. If you want to permanently setup your emacs for Windows-1252 you can consult the page on emacs Russification at emacswiki. I cite here the most important settings for your init file. ;; (setq-default coding-system-for-write 'koi8-r) ;; Maybe not!